Secure destruction doesn’t just end with paper records. Electronic media destruction and hard drive shredding is vital to ensure that your electronic information doesn’t get into the wrong hands. Even if you think you have completely erased your hard drive, corporate spies have several methods to get that ‘erased’ data. Get detailed information on the importance of hard drive destruction and properly disposing of your data when you retire office equipment here. Click on any of the titles below to learn more! When they hear shredding, most people think of paper, but with the growing use of electronics it’s becoming important to securely dispose hard drives and electronics as well. Find out how the process works, and why it’s time to jump on board hard drive destruction train if you haven’t already here. This article will help you determine where sensitive information is stored on various electronic devices, and how to make sure that your electronics are properly handled and all sensitive information is destroyed. Take the time to look into proper disposal of your e-waste before you try to dispose of any of your electronic devices. The time to make sure that our environment is protected is today. If we don’t look out for our future, who will? 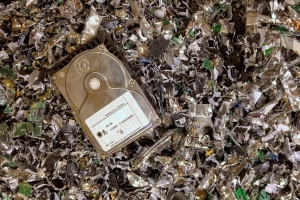 The three most popular ways to destroy information on hard drives is software erasure, degaussing, and physical shredding. Learn about how each method is implemented, and how they work. This article will help define Hard Drive Destruction and Mechanical Destruction, and provide you with several options that help guarantee that your hard drive will never be accessed again. Do You Need Hard Drive Shredding Services or Electronic Media Destruction? Shred Nations offers hard drive destruction services and electronic media destruction that ensures that all data on your drives are completely unrecoverable. Our trained staff of specialists that can help you decide what the best course of action is for your project. Shred Nations has a network of contractors that allows us to come to your location if you need to ensure a proper chain of custody, or we offer the ability to have you ship your drives or media to a secure facility to be destroyed. We also provide a certificate of destruction that details when and where the hard drive was destroyed. To get started, fill out the form to the right, or give us a call at (800) 747-3365 for a FREE, no obligations quote in minutes!